Abstract: A static cosmological metric is derived that accounts for observed cosmic redshift without the requirement for an expanding universe. The metric is interpreted in such a way as to predict a universal potential that accounts the anomalous acceleration of outlying stars of spiral galaxies (the galactic rotation curve), obviating the need for dark matter or modifications to general relativity. A. Koekemoer (STScI), R. Windhorst(ASU), Z. Levay (STScI) — Galaxies fill the Hubble Ultra Deep Field 2014. The dimmest galaxies are more than 10 billion times fainter than stars visible to the unaided eye and represent the Universe in the extreme past, a few 100 million years after the Big Bang. The Big Bang (BB) theory has been questioned over its 85-year history for a number of fundamental reasons. That all the matter in the universe was created instantly at a single point some finite time in the past defies intuition as well as established conservation laws. That the dynamic general relativistic Friedmann-Lemaitre-Robertson-Walker (FLRW) metric, which forms the basis of the BB theory, is orthogonal in the space and time coordinates raises questions about its mathematical validity, a concern expressed by Friedmann himself in his original paper of 19221. 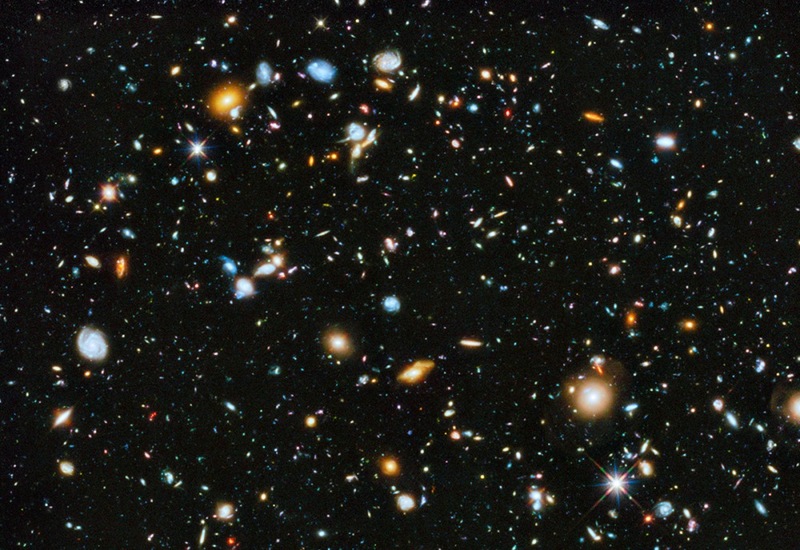 That Hubble deep-field images displaying thousands of distant galaxies reveal no apparent galactic structural evolution seems to suggest the universe is much older than the BB theory purports. Well-established patterns of stellar evolution indicate some stars predate by billions of years the event of the Big Bang, pointing to a flaw in the theory. Questions may also be raised about the superluminal expansion predicted by the FLRW metric, implying possible violations of locally observed special relativity. That Einstein himself believed singularities can’t exist casts doubt on the singular origin of matter. These objections are foundational. It is also unsatisfying that the BB theory fails to predict more recent observations, such as the apparent increase of expansion rate known as cosmic acceleration2,3,4, currently explained by reintroducing Einstein’s abandoned cosmological constant Λ and/or by postulating an ad hoc mysterious quantity called dark energy. The BB hypothesis also does not account for early-epoch cosmic inflation5, nor does it accommodate the unexpectedly large rotation velocities of outlying stars in spiral galaxies, whose anomalous centripetal acceleration is often attributed to an unidentified substance called dark matter. A further defect in the theory is the premise of homogeneity. The universe in fact manifests large-scale inhomogeneities in the form of clusters, walls and voids. Averaging over these density variations has introduced difficulties of its own, a problem known as back-reaction6. Generally, astrophysicists as a community acknowledge these problems inherent in the BB hypothesis7,8,9. Scores of papers are published annually in peer-reviewed journals such as Physical Review D exploring possible solutions to these problems10,11,12. Nevertheless, the FLRW metric of the expanding universe remains the basis for modern cosmology, and is widely accepted among physicists as a valid model. This standard theory of cosmology has been dubbed the Lambda-Cold-Dark-Matter (ΛCDM) model due to its reliance on Einstein’s cosmological constant to account for cosmic acceleration, and its appropriation of cold dark matter to explain the galactic rotation curve. The ΛCDM model is the most comprehensive gravitational model of the universe currently known, and has a distinct appeal in that it preserves general relativity (GR) in its original form. Numerous theories of modified gravity, including bimetric, bigravity or massive gravity theories13,14, scalar-tensor theories (eg. the Brans-Dicke theory15), tensor-vector-scalar (TeVeS) theories16, vector-tensor theories17, modified Newtonian gravity (MOND)18, and f(R) gravity theories that modify Einstein’s field equations (EFE)19,20,21,22, have been investigated, but so far none have proven sufficiently compelling to replace GR as the prevailing theory of gravity. Many such variations suffer problems in the limit of solar system scales, where, to agree with observation, they must predict the same results as GR, giving rise to complicated schemes such as the chameleon mechanism23,24,25 and Galileon fields26. Many of these theories fail the test of Occam’s Razor.